If Yvonne seems a bit aloof, it's not that she doesn't like you — it's just that she has to protect her secret identity. Yvonne's always nice when you run into her — she compliments your hair, and when she asks you how you've been, it sounds like she really cares. But when you ask her how she is, you feel like she's holding something back. And when she disappears for four months, only to say she's been "traveling," you know she is. Maybe she has a secret boyfriend, maybe she's a spy, like Natasha — and maybe she's Batgirl. Yvonne Craig played the caped heroine in the 1960s TV version of Batman, and her little black face mask pretty much epitomizes my mental image of Yvonne. Yvonne's hiding something — either because she has to (otherwise she'd compromise her ability to vanquish villains), or, more disturbingly, because she wants to. A mask can be necessary, concealing a secret life or perhaps a dark past she doesn't want to talk about. But it can also be coy, and the danger with Yvonne is that she's only putting it on to intrigue you. Like the girl who claims she's "from everywhere" when really she's from Tulsa, a false Yvonne can be all secret and no substance. 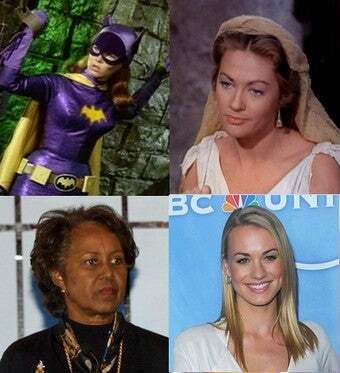 Meanwhile, a true Yvonne could be saving the world — but you'll never know it. Famous Yvonnes are few, perhaps because bearers of the name like to keep a low profile. There's Yvonne Brathwaite Burke, California's first black Congresswoman — if she had a secret identity, it unfortunately may have involved illegally living outside her district. Yvonne De Carlo played Charlton Heston's wife in The Ten Commandments, and, perhaps less illustriously, Lily Munster. Interestingly, Yvonne was originally a middle name for both Burke and De Carlo, suggesting that it may be a name you assume, rather than one you're given. Australian actress Yvonne Strahovski plays Sarah Walker on TV's Chuck, but even she has changed her name — from Strzechowski to Strahovski. While she changed her name to make it easier on American tongues, it's possible that Yvonnes are natural name-changers, putting on and taking off identities like, well, masks. Yvonne has fallen out of vogue, from a peak of #120 in the US in the thirties to the point where it's no longer in the top 1000. Parents-to-be could choose to remedy that by christening more baby Yvonnes — but do you really want your kid to hide her identity from you? Better, perhaps, to wait, and let her name herself Yvonne if she feels like it. At least then you'll know she's hiding something. If you&apos;re blessed with an X name, you&apos;re probably pretty fierce — because you have to be.